[Open Box] UO Smart Beam Laser Projector l Focus-Free Eye-Safe 2018 CES Awarded! 4.5 out of 5 stars - [Open Box] UO Smart Beam Laser Projector l Focus-Free Eye-Safe 2018 CES Awarded! 15 product ratings15 product ratings - [Open Box] UO Smart Beam Laser Projector l Focus-Free Eye-Safe 2018 CES Awarded! I bought this to do a review and no longer need it. CONDITION : PRE-OWNED (USED) (SEE PICS FOR REFERENCE). SK UO Smart Beam ART Portable Mini Beam Projector Smallest size and Portability / High Definition and Image Quality / Smart-Anytime/whereUltra small Size/Weight 1.8-inch Cube(1.8"Ã—1.85"Ã—1.8") 4. 5 out of 5 stars - Laser Beam Pro C200 Portable Bluetooth Wifi HD Laser Projector 2018 CES Awarded! 2 product ratings2 product ratings - Laser Beam Pro C200 Portable Bluetooth Wifi HD Laser Projector 2018 CES Awarded! (Like new) UO Smart Beam 2. LG Electronics PH150G Mini Beam LED Projector. Bluetooth Sound Out. Wireless Screen Share Connection (with Android O/S, WiDi). About this item. 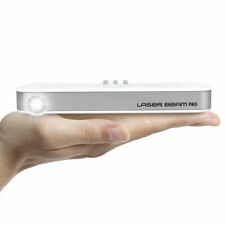 LG Mini Beam Nano Projector DLP LED WVGA 854x480 PV150G Embedded Battery. Open box unit. No return policy. The world's smallest DLP projector. Adopted the upgraded DLP technology, provides more brightness than ordinary LED projector, enjoy sharp image in dark room. Display tech: DLP. 1 × Projector. Native resolution: 640×360. LG Electronics PH30JG LED Projector with Built-in Battery and Bluetooth Sound. PH30JG Projector. Double feature, anyone?. The PH30JG enables portable freedom plus wireless convenience, supporting Bluetooth audio out and Screen Share. Up for sale is a great LG Ultra short throw Laser projector, works good but has a slight darker spot in the right corner because of the reflector in picture 2 is a bit scratched. However when it is turned on the slightly darker spot is barely noticeable even on a white picture or scene. Fun (Display) Leg not included. Model: PV150G. LED WVGA 854x480. Native Resolution: WVGA (854 x 480). LG Minibeam Nano DLP Projector. Display Type: DLP. Digital Keystone Correction: Auto Keystone (vertical). Up to 100" Screen Size in 480p LED Color. 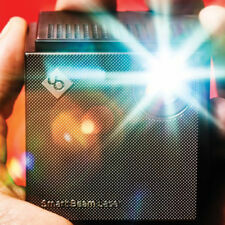 The world's smallest DLP projector. 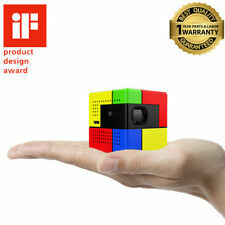 The 1.8" 1.8" 1.8" mini cube project that could be hidden in your palm, is a breakthrough. Adopted the upgraded DLP technology, provides more brightness than ordinary LED projector, enjoy sharp image in dark room.